(Newser) – Bobby Brown confused the gossip world Saturday night when he said while performing at a concert in Texas, "Bobbi is awake. She's watching me." 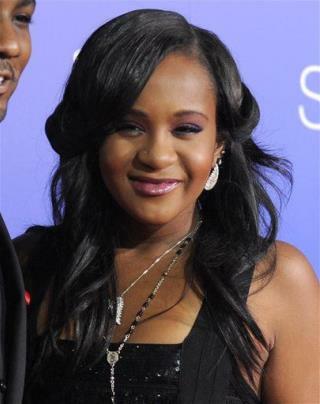 But now it appears he was speaking literally and that his and Whitney Houston's daughter, who has been in a coma since January, is indeed awake, TMZ and Us report: Bobbi Kristina Brown's aunt, Tina Brown, posted on Facebook yesterday, "yes,she woke up and is no longer on life support!!!!! :):)God is good! !thanks for your prayers,,still a process,but she is going to be ok:):):):)"
Not according to her grandmother. She's brain dead as stated by the hospital that first cared for her. They proposed to pull the plug but the family refused. Soooooooooo, where is the video proof of said consciousness? This is the age of the smart phone, where cops are being recorded taking a dump.....but no-one with access to this miracle of prayer and science can come up with a clip ?!? Sorry, but I call BS - The Bobbi Kristina family is no better than the Jahi McMath family!! !